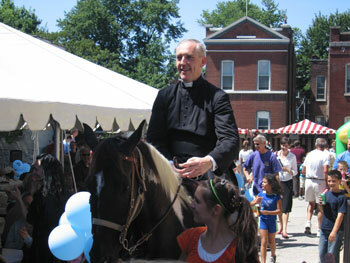 With hours of family-friendly fun, we have celebrated another annual Summer at the Oratory. This year our celebration was held on Sunday, August 18th after the 10am High Mass. Every year this event seems to grow in strength – both the internal bonds within the Oratory, the external bonds with our neighbors in the Historic Fox Park Neighborhood, and the larger community of our beloved city. Once again, we would like to thank all of you for supporting this event, and for bringing your friends and family. We are especially indebted to all the volunteers, without whose excellent, competent, and dedicated work, this would not have been possible. We are grateful to God, all volunteers and the many guests who came and celebrated this day for an approximate profit for the Oratory of $8,500.00. Thank you, and let’s look forward to next year! This coming Sunday, the first in October, we celebrate the External Solemnity of Our Lady of the Rosary. 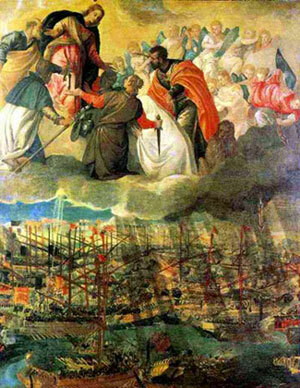 The feast itself, celebrated on October 7, commemorates the battle of Lepanto in 1571, when a Rosary procession in Rome ordered by Pope Pius V turned the tide of war, and ended in the great sea battle victory of the Holy League against the fleet of the Ottoman Empire. On the feast of the Assumption, Pope Francis urged the pilgrims who came that day to Castel Gandolfo to pray the Rosary: “Mary joins us, she fights at our side. She supports Christians in the fight against the forces of evil. Especially through prayer, through the rosary." Again calling on the powerful intercession of the Blessed Virgin to fortify us and help us in our daily battles, we will pray the Rosary daily before the Blessed Sacrament at 6:00 PM every evening in the place of Vespers at the Church. Please plan to join us as often as you can. The month of October ends with the Feast of Christ the King on the last Sunday, a feast instituted in 1925 by Pope Pius XI to remind us of the kingship of Christ and His sovereignty over all human affairs. 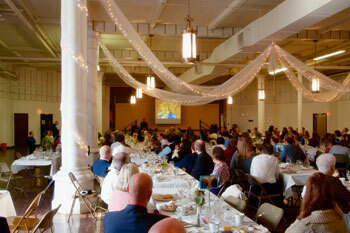 The Seminary Society Breakfast this year will once again feature two fun raffles and a silent auction. As we have mentioned before in previous newsletters, the Institute’s patronal feast of Christ the King is an occasion on which we focus on the center and heart of the Institute: the International Seminary at our Motherhouse in Gricigliano, Italy, where our future priests are formed. After both Masses on Sunday October 27th, the Seminary Society will host a Breakfast and give a short presentation which will give us an opportunity to learn more about the activities and needs of our Seminary, and to adopt a seminarian to pray for in this coming year. Your generosity in supporting the Seminary is deeply and gratefully appreciated. We’re still looking for volunteers to help with the setup & takedown on both Saturday and Sunday. We will also need assistance with servers for after both the 8am & 10am Masses. Please contact the Oratory office at sfds@institute-christ-king.org to volunteer or for more information. Please mark your calendars, and watch for upcoming announcements regarding this Breakfast fundraiser. Be assured of edifying and entertaining surprises! An ongoing problem on our campus has been the leaking flat roof over the garage. It has worsened in the last year to the point that structural damage was beginning to occur to the concrete beams in the boiler room below that support the garage floor. This repair also includes some tuck-pointing work at the top of the wall near the roof. We were able to get a good bid and complete the repair in early September. This should stop the damage and make the garage a more usable space for us. The work also included repairing the small roof over the entrance to the school building which was also leaking to the inside. A year ago last spring, it was with heavy hearts that the faithful and clergy in St. Louis saw Canon Michael Wiener depart for Germany, with uncertain prospects of a serious illness and many rounds of chemotherapy ahead of him. This autumn, it is with profound gratitude to Almighty God that the Oratory welcomed back its Rector, Canon Wiener, as he resumed his duties by celebrating his first public Mass at the Oratory on the Feast of St. Michael the Archangel on September 29th. While this past year has been a difficult one for the Oratory community, it has also been one of great consolation and joy in the affirmation of Divine Providence. It has been a year in which charity, compassion, dedication, and a vibrant prayer life of the Oratory community have shone brightly. For both the clergy and faithful, uncertainty was attenuated by unequivocal submission to God’s holy will, trust in God was strengthened through long hours of prayer, and a greater union with Our Lord on the Cross was achieved through many sacrifices. The Feast of St. Michael gave everyone at the Oratory an opportunity to give thanks to God in the most glorious way Holy Mother Church has taught us: through the Sacred Liturgy. In acknowledging the role of St. Michael the Archangel as defender and protector of the whole mystical body, our sensitivity in the spiritual realm is sharpened and we are made more aware of our vocation to be with God. At the reception which followed the 10am Mass, Canon Wiener once again expressed his profound gratitude to God, and to say in person that his remarkable recovery is entirely attributable to God’s goodness, granted through the generous prayers of all the friends and confreres, and the efficacious intercession of the Blessed Virgin and the saints.